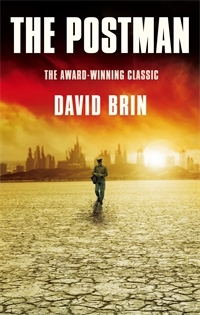 While perusing the bookstore this weekend, I noticed that Orbit has released a new edition of David Brin’s The Postman. Since I have been meaning to read the book for years, I figured this was a good excuse to pick it up. While I enjoyed the book, it fell far short of the classic for which I was hoping. The first half of the book is a fun, tense story of survival, discovery, and the dawning of hope for new future, but the second half bogs down in a mish-mash of different themes and ideas that don’t completely seem to fit together. I got the impression that the author didn’t fully know where the book was going, and perhaps forced it to its conclusion instead of letting it fully develop. Still, I read the book in less than three days, so it certainly pulled me along and kept me entertained. In the rather thin sub-genre of post-apocalyptic works, it probably stands as one of the better ones, but in the larger world of science-fiction and fantasy, it certainly doesn’t crack the top 100. As predicted, the Thames burst its banks yesterday and has made a mess of some parts of Oxford. On my cycle to work, I passed by vast fields which had become shallow lakes and the river itself, which had wiped away the footpath next to it, and spread wide in all directions. At one point, the road was flooded away, although thankfully at a point that I could easily go around. Several other side roads had been closed because of flooding. Thankfully, it looks as though the Thames has peaked. No more rain is expected in the next few days, either here or to the west from whence the Thames originates. The news, however, is not as hopeful for the English Midlands. 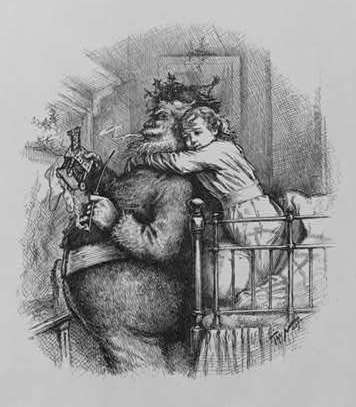 I know it is only November, but I figured that with the millions of letters you receive every year, it might be nice to get some early, so that you can get a head-start on preparing for the ‘Big Night’. The truth is, I’ve been pretty good this year. Not perfect by any means. I’m sure I could have been more charitable, more helpful, and more understanding at times, but I’ve done my best. I know the global economy hasn’t been great these last few years, and I suspect that even the power of Christmas magic might be going through a rough-patch, so I have tried to keep my Christmas requests small. Any of the following items would make a great gift that I would be happy to receive come Christmas day. 1. A really good Phillips head screwdriver. Standard size. Over the last few years, this has been my most used tool, and the head on the poor quality one I have is starting to lose shape. I’d love to have a proper one that will last me for a decade or two. 2. Midshipman’sHope by David Feintuch. I read this book as a teenager and loved it. I think it is time to give it another try and see if it has stood the test of time. 3. I’ve been on a bit of a Jason and the Argonauts kick this year, and I’d love to do some more exploration on the subject. To that end, I’d love to receive The Orphic Argonautica by Jason Colavito and/or The Jason Voyage by Tim Severin. 4. Some rechargeable energizer batteries. I already have the charger, but don’t seem to have quite enough batteries. I could use a pack of AA and/or AAA. 5. Ungor Beastman Box Set. While I’m currently trying to reduce the number of miniatures I own, especially unpainted ones, I’d love got get a box of these guys to use as Satyrs to fight against my Greek Heroes. 6. Cross Refills. With my new, expanded editing duties at work, the red pen ink is flowing faster than ever! Unfortunately, you can’t just pick up red cartridges for a Cross pen in most stationary stores. It's a small list, but hopefully there are a few items you might have in stock. If not, anything involving space ships will probably go down well. Looking forward to seeing you. Hope everything runs smooth this year. - I've been playing around with the look of the Troll. I decided it was time to give it a slightly more 'Renaissancey' look. At the same time, I wanted to make it a little easier to read and increase the size of the main body column so that I could display pictures a bit larger. What do you think? - I missed Miniature Friday, so here's a little shot of 'Sharky'. 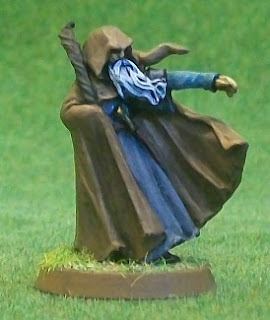 In my humble opinion, this figure is one of the best sculpts in Games Workshop's Lord of the Rings line. True, I think this little guy looks a little too cool to be 'Sharky', but instead, looks more like a classic depiction of Merlin. Either way, it's an amazing little figure and huge fun to paint. - My last post, about sci-fi universes, has just gotten its 500th hit, making it the Troll's most popular blog. It generated a good bit of debate on a couple of forums, with people pointing out several universes that should probably be considered. There were two that really caught my interest: Perry Rhodan, a German sci-fi pulp/paperback series that is still running after 2,700 issues and Mobile Suite Gundam, a Japanese giant robot series has produced a huge slew of movies and television and is also still active. It helped highlight how difficult it is to compare such things across cultures. As it turned out, the most controversial inclusion on my own list was Doctor Who. 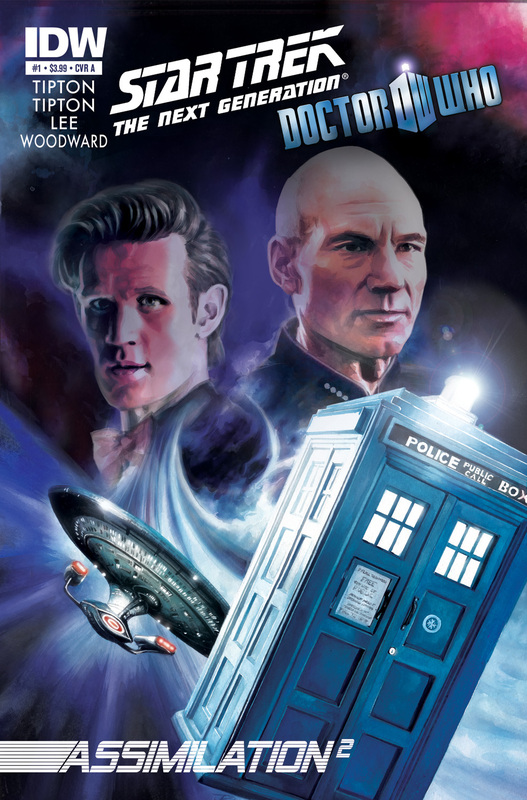 In Britain, Doctor Who is better known that Star Wars and Star Trek put together. In the US, it's probably on a par with Babylon 5. 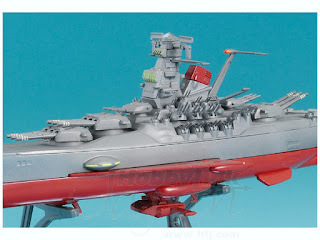 - My post on the Space Battleship Yamato model has became a huge target for spam commentators. While I'm used to getting a spam comment every couple of weeks, this post has gotten about 8 in the last two weeks. I have no idea why this might be. - The Thames has once again risen to the top of her banks. With more rain expected over the weekend, I suspect that at least some parts of Oxford will be underwater. Thankfully, we live on a hill. Yesterday, for no reason in particular, I began to think about the most successful science-fiction universes in film and television. After a bit of internet research, I’ve come up with my top 5. Although the Star Wars universe is not that far ahead of some of its rivals in terms of production, it is at least an order of magnitude above all of the others in terms of recognisability and market penetration. Also, with its recent purchase by Disney, its level of production is set to sky-rocket. With five major television series, producing over 700 episodes, and an even dozen movies, Star Trek is a clear second place. It is also the most ‘high-brow’ science-fiction universe to make the list. While most of its competitors went down the action/adventure route, Star Trek tended to explore larger ideas of social mores, morality, and the human experience. Although set for another major film release soon, the universe really needs a new television show to carry it forward. 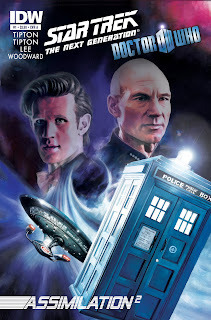 The Doctor Who universe is the only entry in the top five produced outside of the United States, which means it might not be as familiar to a lot of Americans, but this is just one of its many unique features. It is certainly the oldest of the Universes, having first aired in 1963, three years before the first Star Trek. It contains, by far, the longest running television show (even if you separate out the modern incarnation of the show, the original ran for 26 seasons). It is also the only one of the top 5 Universes currently producing a live-action television series. Also, Doctor Who has permeated the culture of Britain far more than even Star Wars has done in America. Included amongst the Doctor Who episode count is 5 Christmas specials, but not included are the numerous short specials that have been produced for charity events, nor the numerous radio broadcasts, the audio plays, the stage plays, etc. The ten seasons of Stargate SG1 makes it the longest running, science-fiction television show produced in North America. However, as none of the shows in the series were originally broadcast on a ‘mainstream’ channel, it never reached the level of profile of those above it on the list. While its last series, Universe, was essentially a failure, this science-fiction universe is still fresh enough, with a large enough fan base, to make a new series a possibility. While I doubt that too many people would argue that my first four universes belong in the top 5, I’m sure my last would generate some debate. It is certainly true that Babylon 5 is significantly less successful than any of those above it, and its position over some of those below is more a matter of taste than quantifiable success. Still, Babylon 5 deserves a lot of credit for its impact on science-fiction, being the first show to really attempt to tell one, epic, tale over the entire length of its run. Unfortunately, television politics managed to make a bit of a mess of it at the end. Still, there was a time when Babylon 5 was the best science-fiction going on television. Unlike the others on the list, it seems probably that Babylon 5 is essentially a ‘dead’ universe, with little hope of there ever being any new films or television series. Many months ago, I bought a beautiful book. I bought it from a little shop in Folkestone for £15, and, I admit, I bought it mainly because it was beautiful. That said, I always intended to read it, and now I have done so. 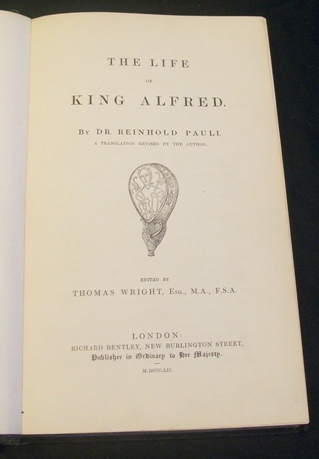 The book in question is The Life of King Alfred by Dr. Reinhold Pauli. 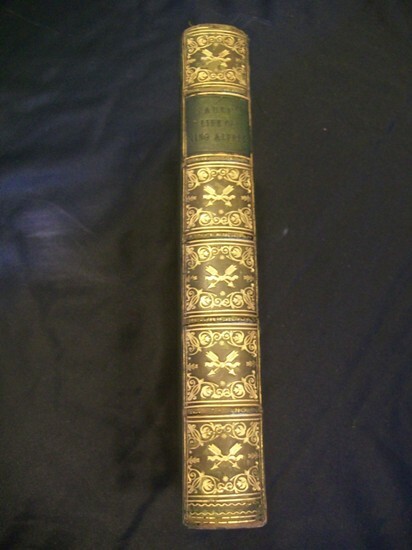 It was published in London in 1852 by Richard Bentley of New Burlington Street*. 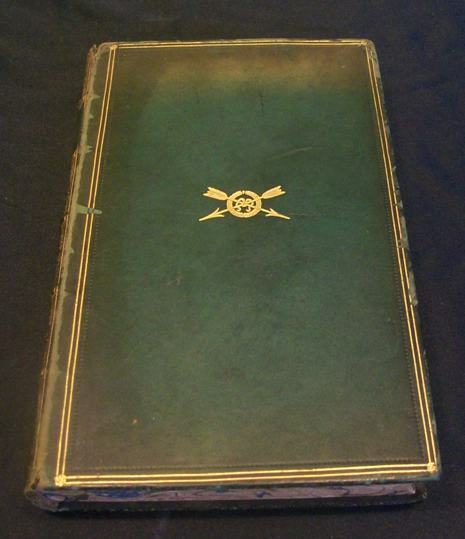 The book is bound in green leather, with gold embossing on the cover, spine, back cover, and even the edges of the cover. The page edges are inked in strange swirling colours. 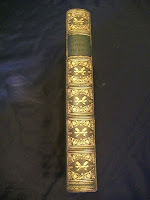 It also has a ribbon, a sign of distinction among books. 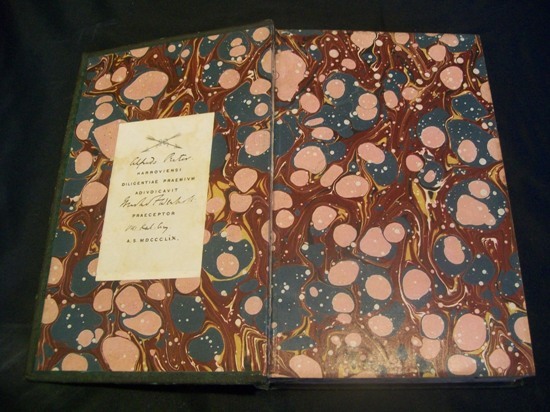 On the inside front cover there is a very intriguing book plate, which I cannot fully understand. It seems to say ‘Alfredo Puter, Harrouiensi Diligentiae Praemium Advidicavit (handwritten name) Praeceptor (handwritten name) A. S. MDCCCLIX'. Okay – my Latin isn’t the best, and it isn’t helped by the font seeming to use the same character for both ‘v’ and ‘u’, but, as near as I can tell this book was awarded to a student, probably Alfredo Puter by his teacher in 1859. If someone with better Latin could make confirm or correct me, I’d certainly be interested. 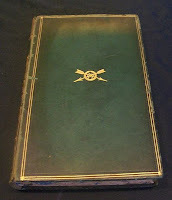 It’s also interesting to note that the symbol on the bookplate is the same as the one embossed on the cover, which leads me to believe that the book was originally sold unbound (as was common at the time) and that the cover and binding was added by whomever purchased the book to use it as a prize. So what of the text? The text is written by a German academic who studied in Oxford in the 1840s. He originally wrote the book in German, where I assume it was also published, and then translated to book into the English. Most of the book is a rather straightforward retelling of the life of King Alfred, and from what little knowledge I posses on the subject, I think most of it is still pretty accurate (unfortunately, there haven’t been any major finds in the last 150 years, that would dramatically alter the known chronology of the period). I was delighted to find, that despite its age, the text was generally easy to read and not overly academic. All in all, it is an interesting work contained in a beautiful book, and I’m glad to be able to put it on my shelf. * Richard Bentley, it turns out, was a rather famous publisher of the time, and worked with a lot of the big name authors of the period, including Charles Dickens, who he apparently couldn’t get along with. The Life of King Alfred was published during a period when Bentley was suffering a series of bad financial reverses. Here it is – my first Battle Cruiser! I don’t make that many models. While I can happily spend countless hours painting little metal miniatures, I have very limited patience when it comes to gluing together and painting plastic model kits. However, I recently stumbled across HobbyLink Japan, and my love of spaceships won out! I placed an order for three spaceship kits, which set me back about £20, including shipping from Japan! I finished up work on the first of the models earlier this week, and I’ve got to say, I’m pretty happy with the results. 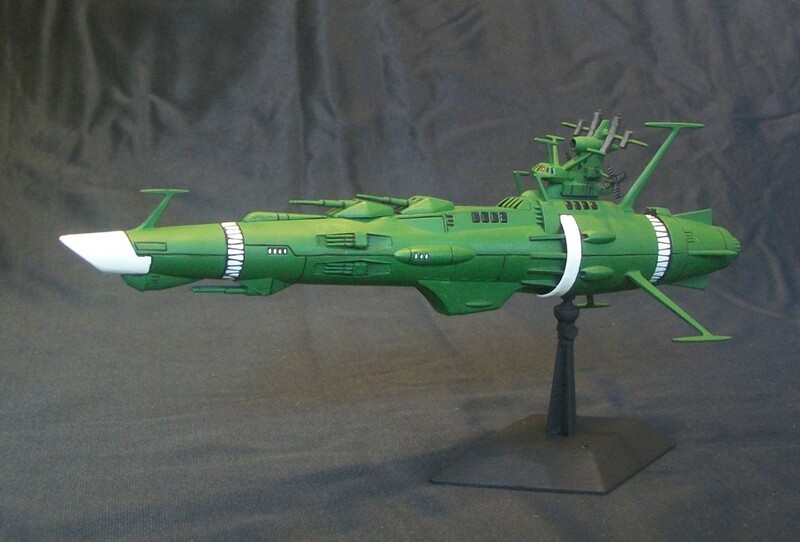 The ship is an Earth-defence battle cruiser from the Space Battleship Yamato (Starblazers) series, and measures in at about nine inches. There is something about the combination of the classic rocket ship body, with a World War II battleship ascetic which really appeals to me. It is just so different from anything seen in Star Wars or Star Trek. Being a cheap and inexpensive model, it wasn't too complicated to put together. In all, assembly took between three and four hours. I left off a couple of the smaller pieces, partly to make my life easier, but also, to keep the ship from looking too bitty. It took me another three or four hours to paint the model. I wanted a simple but striking paint job, and one that showed off the hull paneling. I only used five colours painting the model and two of those were black! (Flat Green, Ivory, Flat Black, Gloss Black, Grey). The top two turrets are rotatable. The bottom one is not, for some reason. The stand is pretty ingenious. It’s a little ball mount that allows the ship to be pointed at a wide degree of angles. I am extremely pleased with how this model came out, which is a somewhat rare experience. I think it is best if I just bask in the glow of this success for awhile before picking up the modelling glue again. The ride to work and back went fine. No problems, no pain, no disasters. Of course, I practically dropped unconscious on my desk at about 3 o'clock in the afternoon, but still, it was worth it. Just over three months after I flipped over my handlebars and cracked my collar bone, I got back on a bike. It was just a short-ride: about 2.5 miles down to the science-park, around the duck pond a few times, and back home, but it felt good. I admit I had a few moments of jitters, but they passed quickly, and were soon lost in the resistance of the pedals and the rhythm of the wheels. I had hoped to get a few more short rides in before making the long ride to work, but life and weather conspired against it. 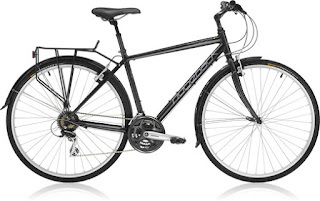 I spent the first part of this evening getting my bike ready for the commute. Amazingly, the only part of my bike that seems to have suffered any major damage in the crash was the bell, which lost its hammer. I replaced that. I also fitted a new ‘Lezyne Mini Drive’ light. This little sucker throws out some serious lumens and has to be recharged through my computer. So, assuming it isn’t pouring down rain when I wake up tomorrow, I’ll be saddling up the Ridgeback Meteor, and rolling on to work! A couple of years ago, I discovered Jack Campbell’s LostFleet series, and it quickly became my favourite military space adventure series of all time. By combining ideas drawn from the Cold War, the Interstate system, Xenophon, and Arthurian legend, Campbell created a retro-science-fiction universe where his protagonist, ‘Black Jack’ Geary, could shine brightly by standing for classic values in the midst of a century long war. 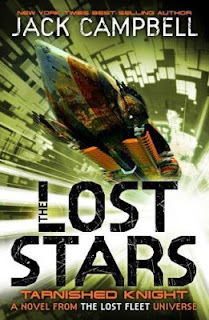 After six books, Campbell wrapped up the Lost Fleet series, and, soon thereafter, launched two follow-up series: The Lost Fleet: Beyond the Frontier, a direct sequel to the first series, and The Lost Stars, which would take a look at some of the characters who fought against ‘Black Jack’ Geary. Earlier this month, Jack Campbell released the first of this second follow-on series, The Lost Stars: Tarnished Knight. I picked it up a couple of days after release and had finished reading it less than four days later. Essentially, it follows the story of two characters, a politician and a soldier, who lead a rebellion against the ruling communist government of their star system. It’s an action-packed story that bumps along at a good pace, but suffers from two problems compared to the Lost Fleet. First, despite his best efforts, Jack Campbell dosen’t seem completely comfortable writing non-heroic characters. His protagonists are both members of the former Syndic (read: communist) hierarchy, and although both have been sidelined for not completely following ‘the system’, they are still very much products of that system. Most of their time is spent worrying about when or if the other conspirator will stab them in the back. Unfortunately, since the reader quickly realizes that neither is planning to do such a thing, reading about these worries grows a bit tiresome. Still, this is a minor issue. A slightly larger issue is the lack of a driving plot for the book/series. The Lost Fleet had the brilliant premise of a battered battle fleet trying to bluff and fight its way home. Although this book has an interesting starting point of the revolution, it is not clear how, or where, the series could satisfactorily end. Despite these problems, I still very much enjoyed the book. Even when Campbell is not at the top of his game, he has an easy writing style that draws the reader in and keeps him entertained. 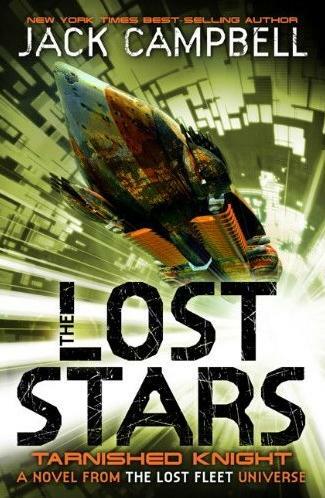 While I’m glad that Campbell’s next book is scheduled to be from the Lost Fleet: Beyond the Frontier series, I will certainly pick up the next Lost Stars novel soon after it is released. When I was around ten or so, I stumbled upon a cartoon called Starblazers. It was a Japanese import, and came with all the strange animation quirks for which old school japanimation is famous, but it also had, by far, the coolest space battles to be found on television at the time. In every episode, giant battleships and cruisers opened up on one other with laser batteries and missile pods, while sleek fighters dodged in and out. I loved it! For those not in the know, here is a quick summary. Evil aliens attack the earth, sweeping aside our space defences, and bombard the planet with radiation bombs. The few human survivors are forced underground, to endure their last miserable years before the radiation kills them. But there is a glimmer of hope. A message pod arrives from a distant group of friendly aliens. They claim to have the cure for earth’s radiation; unfortunately, the humans will have to come pick it up. Included in the pod are plans for a super space drive and weapon system that should get the humans across the galaxy to pick up the cure. 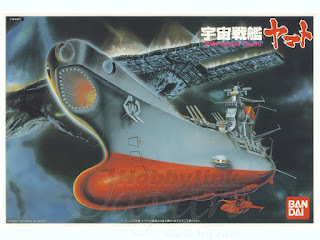 The problem is, humanity no longer has the construction capacity to build a new space ship – SO (here is the great part) – they retrofit the hull of the Super Battleship Yamato, that was sunk during World War II, with the new drive and weapon system, and blast that sucker into outer space! Booyah! Using the power of the new ‘Wave Motion Gun’, the Space Battleship Yamato (called the Argo in Starblazers), shoots its way through the evil alien blockade and sets off on a journey to the far side of the Milky Way. But they only have one year to save the earth! 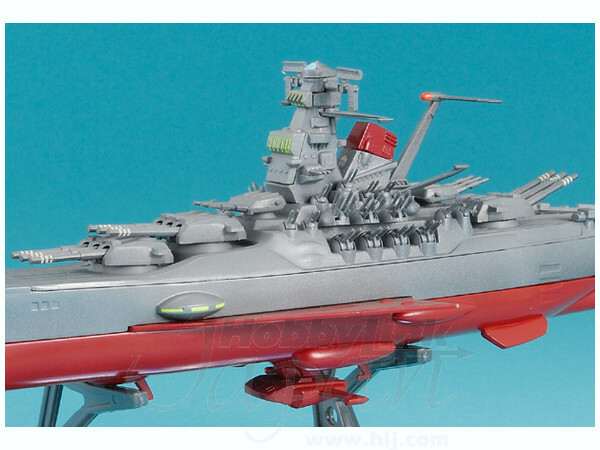 If like me, your favourite geek, remembers the cartoon foundly, you might think about getting them a model of the Space Battleship Yamato this Christmas. Thanks to the wonders of the highly advanced Japanese modelling industry, there are several choices available. However, unless your geek is a highly advanced modeller, might I suggest this one: Space Battleship Yamato from Hobby Link Japan. It costs an incredibly reasonable $7 (although shipping from Japan will nearly double that), and is relatively simple so that even casual modellers shouldn’t have too much trouble with it. A few weeks ago, I made my first ever order from Hobby Link Japan, but I’ll leave that story for another day.